‘La Traviata’ was one of the cultural highlights of 2011 and featured the most spectacular traditional staging to ever visit Irish shores. 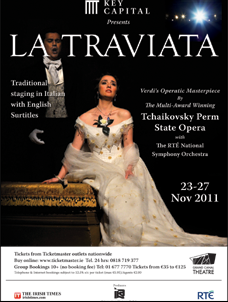 The world renowned Tchaikovsky Perm State Opera performed its incredible full-scale production of Verdi’s operatic masterpiece, ‘La Traviata’, at the Bord Gais Eneragy Theatre for five nights in November 2011. The were joined by some of the finest guest vocalists from other Russian companies, and accompanied by The RTE National Symphony Orchestra. Masterfully directed by the award winning Artistic Director George Isaakyan, this spectacular production of ‘La Traviata’ was performed in Italian with English subtitles. Based on La dame aux Caméliass, a play adapted from the novel by Alexandre Dumas, fils, ‘La Traviata’ was first performed on 6th March 1853 at the La Fenice opera house in Venice. Its unquestionable popularity has seen ‘La Traviata’ become a staple of the standard operatic repertoire and one of the most performed operas in the world today. Producing breathtaking performances all over the world, from China to Germany, to the world famous Carnegie Hall in New York, The Perm State P. Tchaikovsky Opera and Ballet Theatre (to give the theatre its full title) is one of Russia’s oldest and most distinguished companies and the only company that has performed all ten of Tchaikovsky operas.